Front Yard Gardens, from our readers! Wow, we got some good responses to our last post, including a posting over at Northwest Food News! Reader Casey O’Leary sent these photos of her front yard garden. These are hops growing up the side of Casey’s house. Hops, obviously, are used in brewing beer, and Casey does brew her own. 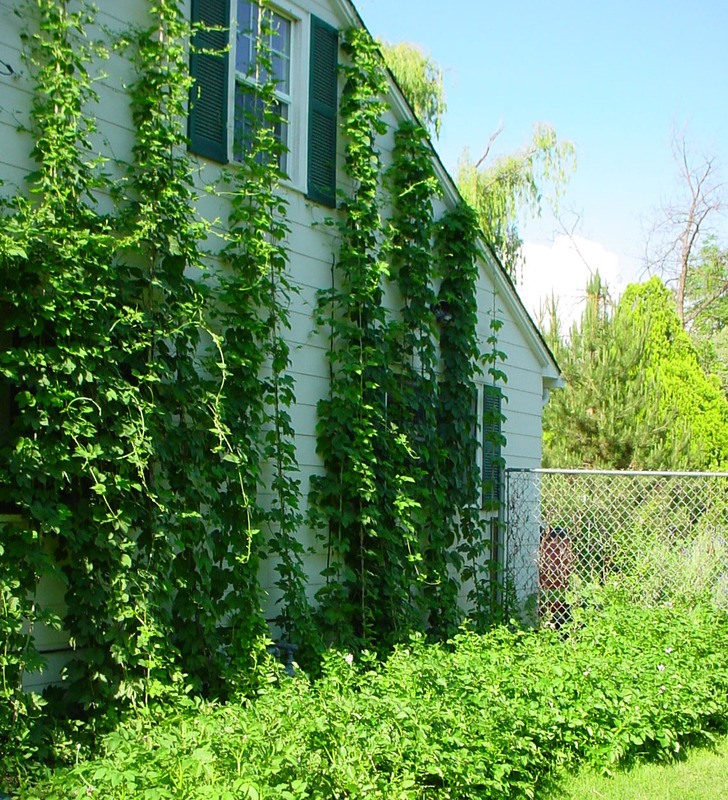 Other vine options for using vertical space beside a house or a fence include grapes, though they take a few years to get going, and pole beans, which last just one year. Hops are a perennial, so will return year after year. If you’re luck enough to live somewhere warm (sigh, Florida), my absolute favorite is passion fruit. It’s viney similar to grapes but grows faster and makes a gorgeous flower, and the juice from the fruit is wonderful. Casey also says that vines are nice for shading the sunny side of a house. Here’s Casey’s front yard and pathway. She has a mix of flowers, herbs, and edibles. The best place for an herb garden is, of course, as close as possible to your kitchen, since they are best snipped fresh when you are ready to use them. Casey also makes these gorgeous garden walkways using recycled materials and is available to help you make one, or plan and install your own front yard garden. Casey and Marty used to be farming partners when they first started out, and Casey now runs Earthly Delights, a CSA farm and sustainable landscaping business. You can get info about both at her website, earthlydelightsfarm.com. Thanks for the photos, Casey! 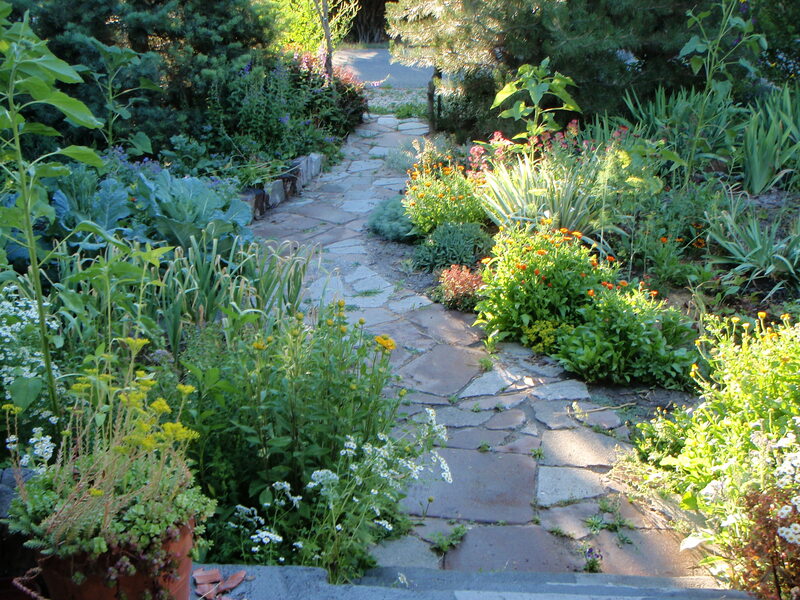 Tags: Casey O'Leary, Earthly Delights Farm, front yard gardens, hops, recycled garden pathway. Bookmark the permalink. My grandson Andrew Grella has a front yard garden in the city of Beacon NY. He plans on trying corn next year. Guess he inherited that Nebz farming gene!! Awesome! Tell him to plant a block of corn rather than a long line, it will pollinate better, but it’s still hard to grow in small quantities. Tell him to send a photo if he has one. Nice to know we have readers far and wide! I think it’s awesome he’s going to grow a front yard garden, but corn is soooo cheap and you need way too much to make it worth it. He should grow beans instead. Or something else he loves and can really get an abundant harvest from.